A valiant attempt to disentangle the many threads snarled in the continuing African tragedy. Epstein (The Invisible Cure: Why We Are Losing the Fight Against AIDS in Africa, 2007) has reported extensively on Africa for the New York Times and the New York Review of Books, among other publications. Here, the author recalls an African myth in which a wily hare outwits powerful but dimwitted enemies and then likens Ugandan dictator Yoweri Museveni to the clever hare manipulating bumbling Americans. She charges that the United States, while purporting to support the growth of democracies, has ignored his corruption and human rights violations as long as he has convincingly claimed that Uganda is a democracy and has appeared to be a bulwark against advancing Islamic terrorism. She reports that Museveni’s American-trained army “has been highly effective in crushing nascent democracy movements in Uganda and in other countries,” and she grimly details the dictator’s outsized ambitions and atrocities against innocent people. The numerous unfamiliar African names and a plethora of abbreviations for various military forces—e.g., NRA, LRA, RPF, AFDL, SPLA—will challenge readers who do not pay close attention to the text. 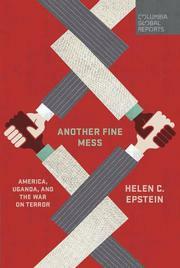 Fortunately, Epstein prefaces her work with a concise timeline of events in Uganda, Rwanda, Sudan, Zaire/Congo, and Somalia that can be consulted by readers struggling to understand her dense account of the violence and corruption that have beleaguered that part of the world. So what should the U.S. do to change the situation? According to the author, it’s crucial that we renew the pledge to support the Universal Declaration of Human Rights, but a specific plan of action is not included. A sizzling indictment of Uganda’s current strongman and of the American policy in Africa that supports his corrupt regime with generous foreign aid.